Des Moines, Iowa (CNN) – On Thursday, Mitt Romney faced the joys and political perils of a frontrunner in the Republican presidential race: at times feeling his supporters' political crush - but also fending off catcalls and heckles by critics. The spontaneous drama at the Iowa State Fair in Des Moines took several bizarre turns. In one instance, the candidate declared "corporations are people" - a line surely to become ammunition for political opponents eager to cast Romney as a wealthy corporate raider unfamiliar with the concerns of average Americans. At times Romney sounded populist themes, at one point saying: "If we're going to turn around the economy … Let's send some citizens to Washington." And yet, in another breath, the former Massachusetts governor defended big business against high taxes. 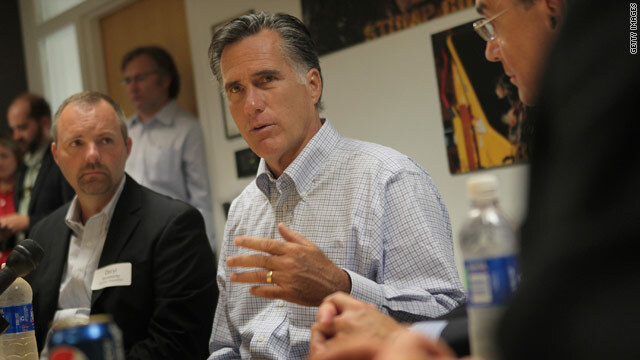 "Corporations are people, my friend," Romney said. "Everything a corporation earns ultimately goes to people." Critics in the crowd laughed at Romney for the comment though his intent was unclear. That hasn't stopped the Democratic National Committee from already seizing on the line. "It is a shocking admission from a candidate-and a party-that shamelessly puts forward policies to help large corporations and the wealthiest Americans at the expense of the middle class, seniors, and students," DNC Chair Debbie Wasserman Schultz said in a statement. In opening remarks, Romney reiterated familiar slams against President Obama. "We're led by a man who's a fine fella. But he's out of his depth and doesn't understand how the economy works," Romney said. It's when Romney ended his speech, and took questions from the audience, that things turned ugly. Among the first questions shouted at Romney: "Do you support scrapping the Social Security payroll cap so that rich people pay their fair share into the trust fund?" Romney's response: "You know there was a time in this country that we didn't celebrate attacking people based on their success. And we didn't go after people because they were successful." Another questioner belted away at Romney. "Sir, I am on Social Security," he said. "My wife is on Social Security. You came here to listen to the people. How are you going to strengthen Social Security for the future?" As the man continued to shout, Romney cut him short. "You asked your question and now I am going to give my answer. If you don't like my answer then you can vote for someone else," Romney chastised. "But now it is my turn to give my answer." The man later identified himself as Joe Fagan, a 71-year old former Catholic priest. He is the founder of the liberal community activist group Citizens for Community Improvement. In the past, Fagan has similarly heckled other Republican politicians. As Romney insisted he would not raise taxes, the exchange became testy not unlike a defining moment in 1980 as then presidential hopeful Ronald Reagan demanded access to a Republican debate and at one point shouted at a moderator, "I am paying for this microphone." In perhaps the most tense moment of the event, yet another man shouted that Romney should support scrapping the Social Security payroll cap. "You want to raise taxes? You want to raise taxes," Romney shouted back at the man. "...if you don't like my answer you can vote for someone else." Thanks Mitt, I most certainly will vote for someone else. Carrying any $1 bills with you today? The idiot hecklers where from a liberal activist group and there just to cause problems. They looked like total buffoons to me. Also I am an employee at a corporation... I can tell you I certainly do get paid to work there by my boss. If my boss gets taxed a bunch more where do you think that money is going to come from? His employees. I don’t understand how anyone could not understand that. This clown needs to go back into the "Mindless Mittness Protection Program". Debbie Wasserman- "[Republicans] help large corporations and the wealthiest Americans at the expense of the middle class, seniors, and students." She's just another Democrat who doesn't acknowledge the fact that people from my friends (who are students) to my middle-class coworkers to my mom and my grandma (who are seniors) have money invested in various corporations. When you hope for the success of a corporation, you hope for the success of all those people as well. Since corporations are people, why don't these "people" have the same responsibilities and rules as real people. Pay your damned taxes like the rest of us. It’s that entitlements mentality that has overcome America that is destroying it. I like Romney’s comment regarding the value that we once placed on success—too bad that value no longer exists. America has always been the land of equality of opportunity—simply meaning that if you WORK hard enough, if you SACRIFICE enough you can improve your own living condition. That was never meant to mean that all people would succeed, or that we would all live in an equal level of comfort. Not all people have the drive or desire to make the sacrifices required to move up. I work full time, go to college full time, and spend whatever remaining time I have on my family—that is not because I have to or because I like, but it is because I want a better life for my children so I am willing to make the sacrifice! That's just the beginning Romney! Corporations are a fairly effective way to organize the activities of a group of indivuduals toward the prupose of delivering goods and services. While society reaps a variety of benefits from corporations, we must keep in mind that, in the end, their only real purpose is to generate profits for their shareholders – everything else they do is a means to that end. They will find the easiest, fastest, and most cost effective ways to achieve that promary objective. Their potential negative impacts are only tempered by laws, regulations, and the threat of legal action. Without those constraints they would abuse employees, customers, and the community at large in a variety of ways; from faulty products, to abusive labor practices, to fouling our air, land, and water, and degrading the communities in which they operate. Corporations are NOT people. Theoretically, they have unlimited life. They do not have hearts, They do not feel pain. They have not conscience. That does not mean that the individuals within the corporation don't have hearts or conscience, but their responsibilities within the corporate struture and the incentives they work under push them toward decisions that may or may not be in the best interest of their employees and communities at large. It's just the way it is. Corporations are NOT people and should not have the same rights as living, breathing human beings. There are plenty of people to speak and vote in the best interest of corporations and they have plenty of power in their own right. Thats gonna hurt his chances of getting elected. Now if only people knew he is actually a part of the FLDS but as statistics go the majority of people are stoopid. Romney's comments show that he is ill prepared and out of touch with the voters. This does not bode well for him in the upcoming debates. One would expect him to have adequately prepared for tough questions. Money from corperations go to the people he said, I have not heard such crap in all my life, I guess he was thinking of the ceos and hedge fund managers as regular people. So sad that the GOP has no sense of fairness at all. The rich need to pay their share! Why does the GOP consider an honest question an attack? Romney is a flip flopper who will not become POTUS. Liar, all the evul corporations are ran by tea bagger robots, Moore-on.org told me so. And I thought Soylent Green was people. The leftists loons and professional hecklers will be coming out in droves to harrass and assault people with their pies. Of course, Obama's crowds are all preselected and screened to get nothing but adoring koolaide drinkers like this Fagan fool. Nobody said they are aliens, but the type of people who do not care for the society.